PM #40762529 $5.00 • Vol. 29, No. 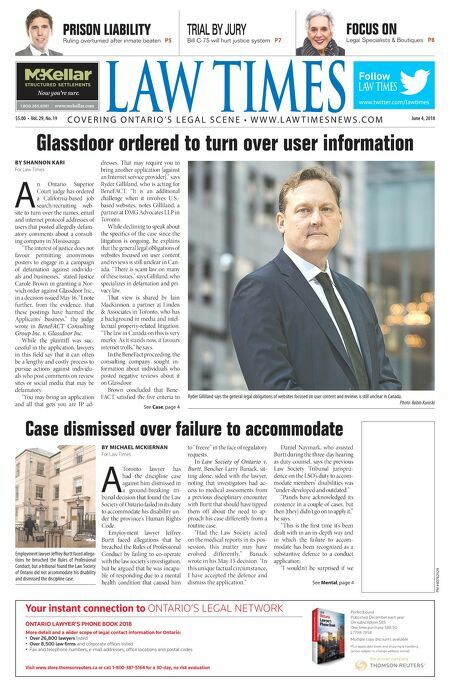 19 June 4, 2018 L AW TIMES C O V E R I N G O N T A R I O ' S L E G A L S C E N E • W W W . L A W T I M E S N E W S . C O M Glassdoor ordered to turn over user information Ryder Gilliland says the general legal obligations of websites focused on user content and reviews is still unclear in Canada. Photo: Robin Kuniski PRISON LIABILITY Ruling overturned after inmate beaten P5 TRIAL BY JURY Bill C-75 will hurt justice system P7 FOCUS ON Legal Specialists & Boutiques P8 BY SHANNON KARI For Law Times A n Ontario Superior Court judge has ordered a California-based job search/recruiting web- site to turn over the names, email and internet protocol addresses of users that posted allegedly defam- atory comments about a consult- ing company in Mississauga. "The interest of justice does not favour permitting anonymous posters to engage in a campaign of defamation against individu- als and businesses," stated Justice Carole Brown in granting a Nor- wich order against Glassdoor Inc., in a decision issued May 16. "I note further, from the evidence, that these postings have harmed the Applicants' business," the judge wrote in BeneFACT Consulting Group Inc. v. Glassdoor Inc. While the plaintiff was suc- cessful in the application, lawyers in this field say that it can often be a lengthy and costly process to pursue actions against individu- als who post comments on review sites or social media that may be defamatory. "You may bring an application and all that gets you are IP ad- dresses. That may require you to bring another application [against an Internet service provider]," says Ryder Gilliland, who is acting for BeneFACT. "It is an additional challenge when it involves U.S.- based websites, notes Gilliland, a partner at DMG Advocates LLP in Toronto. While declining to speak about the specifics of the case since the litigation is ongoing, he explains that the general legal obligations of websites focused on user content and reviews is still unclear in Can- ada. "There is scant law on many of these issues," says Gilliland, who specializes in defamation and pri- vacy law. That view is shared by Iain MacKinnon, a partner at Linden & Associates in Toronto, who has a background in media and intel- lectual property-related litigation. "The law in Canada on this is very murky. As it stands now, it favours internet trolls," he says. In the BeneFact proceeding, the consulting company sought in- formation about individuals who posted negative reviews about it on Glassdoor. Brown concluded that Bene- FACT satisfied the five criteria to See Case, page 4 Case dismissed over failure to accommodate BY MICHAEL MCKIERNAN For Law Times A Toronto lawyer has had the discipline case against him dismissed in a ground-breaking tri- bunal decision that found the Law Society of Ontario failed in its duty to accommodate his disability un- der the province's Human Rights Code. Employment lawyer Jeffrey Burtt faced allegations that he breached the Rules of Professional Conduct by failing to co-operate with the law society's investigation, but he argued that he was incapa- ble of responding due to a mental health condition that caused him to "freeze" in the face of regulatory requests. In Law Society of Ontario v. Burtt, Bencher Larry Banack, sit- ting alone, sided with the lawyer, noting that investigators had ac- cess to medical assessments from a previous disciplinary encounter with Burtt that should have tipped them off about the need to ap- proach his case differently from a routine case. "Had the Law Society acted on the medical reports in its pos- session, this matter may have evolved differently," Banack wrote in his May 15 decision. "In this unique factual circumstance, I have accepted the defence and dismiss the application." Daniel Naymark, who assisted Burtt during the three-day hearing as duty counsel, says the previous Law Society Tribunal jurispru- dence on the LSO's duty to accom- modate members' disabilities was "under-developed and outdated." "Panels have acknowledged its existence in a couple of cases, but then [they] didn't go on to apply it," he says. "This is the first time it's been dealt with in an in-depth way and in which the failure to accom- modate has been recognized as a substantive defence to a conduct application. "I wouldn't be surprised if we See Mental, page 4 Visit www.store.thomsonreuters.ca or call 1-800-387-5164 for a 30-day, no risk evaluation ONTARIO LAWYER'S PHONE BOOK 2018 More detail and a wider scope of legal contact information for Ontario: • Over 26,800 lawyers listed • Over 8,500 law firms and corporate offices listed • Fax and telephone numbers, e-mail addresses, office locations and postal codes Perfectbound Published December each year On subscription $85 One time purchase $88.50 L7798-7858 Multiple copy discounts available Plus applicable taxes and shipping & handling. (prices subject to change without notice) Your instant connection to ONTARIO'S LEGAL NETWORK Untitled-1 1 2018-05-22 10:32 AM www.twitter.com/lawtimes Follow & $#&!&jmmm$cYa[bbWh$Yec ntitled-4 1 12-03-20 10:44 AM Employment lawyer Jeffrey Burtt faced allega- tions he breached the Rules of Professional Conduct, but a tribunal found the Law Society of Ontario did not accommodate his disability and dismissed the discipline case.